An early morning tee off on the back nine of the Sultan course just after day-break was greeted only by the sound of two stroke leaf blowers as the Australian Eisenhower Team of Matt Stieger, Daniel Nesbit and Cameron Smith prepared for the World Amateur Teams Championship in Turkey. No heat, no humidity and no one else on course ahead of them. This meant a productive and not too exhausting workout. They soon learnt that the heavier morning air was cutting back shots by 10% as fairway traps were found that would not usually be in play. Despite this they all reached the Eucalyptus lined 433m par 4 12th, which is described as one of the toughest par 4s in Europe, in regulation. 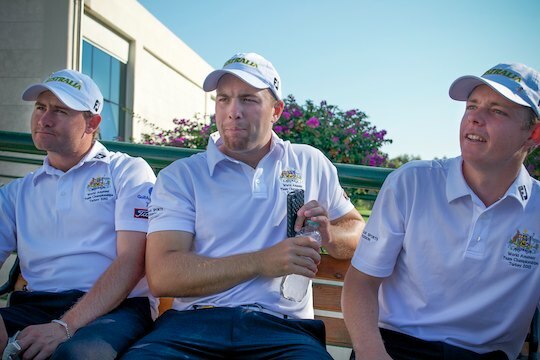 Nisbet is pleased with the tee times for the first and second rounds and all members of the three-man team are optimistic of a better performance than the 26th position in Argentina in 2010 – the lowest ever by an Australian team at these championships. The guys tee off at 11.35am on Thursday at the Gloria Golf Club and then at 8am on Friday at PGA Sultan. Australia has had mixed success in these championships, and in recent times the performance of our teams has been average. We collected the silverware in 1958 at St Andrews – the first staging of the World Amateur Teams championship – and have only won the title twice since, at Mexico in 1966 and 30 years later in the Philippines in 1996. Team captain Brad James is excited for the team’s prospects here in Turkey. James could not be drawn on which countries represented the hot competition for the Aussies. He simply stated that any of 15 countries could win the Teams event. Ultimately, it will come down to which team combines the best on these challenging layouts on the day. Both Nisbet and Smith were trumped by Stieger for the honour raising the Aussie flag at the opening ceremony. Stieger won an “up and down” playoff for this role. The opening ceremony came and went on Wednesday night and one gets a strong sense that the guys are through with the formalities and practice – they just want to get out there and compete. Is it Australia’s turn at the World Amateur?